Our partnership with JTAG Technologies enables us to provide you with a comprehensive JTAG Boundary Scan Test Development Service. At ATE Solutions we use JTAG Technologies’ development and production tools, the standard for boundary scan testing throughout the UK electronics industry. We can provide a number of different boundary scan tester services depending on your needs, and our experienced consultants can advise you on the testing process for your product. We provide JTAG Test Vector development for customers with Run Time tools or for solving capacity problems by supplementing In-house development. Save money on boundary scan test fixtures. We have developed a Cassette / Receiver system that reduces fixture costs whilst maintaining reliability by using low cost cassettes. Get detailed information on your JTAG boundary scan test results. We have a suite of software that collects and analyses the test results from JTAG testing. This can work on a cloud server and collect data from multiple test stations. It can also link into a test and repair station that allows the viewing of test results and the entry of repair data. We can also provide a test fixture / program package and can link JTAG vectors with additional test hardware for non boundary scan circuit test. (ie PXI/LXI/GPIB Instruments, PCI DAQ cards). 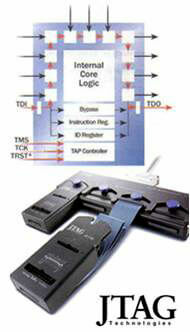 JTAG test vectors can be incorporated into other software packages including LabVIEW™ / TestStand. Our Consultancy Service offers assistance from industry specialists with a wealth of experience in JTAG boundary scan testing. Whether on a daily or per board basis, our expert consultants can advise on test coverage or test strategy.